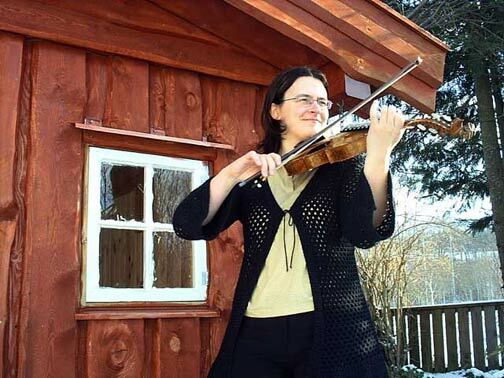 Two Scandinavian folk fiddling workshops, featuring top level fiddlers from Sweden and Norway, will take place on June 10, 2005 at the old Swedish Timber house in Lakeshore, Mn. These workshops are held in conjunction with Nisswa-stamman Nordic Folkmusic festival, June 10, 11, 2005. The sessions will start at 10 a.m. and continue until 3 p.m., with a lunch break in the middle. Students should be at intermediate levels and able or willing to learn tunes by ear. Cost for the sessions will be ~ $20 for a half day or $35 for a full day. Lunch is available for $5. Please contact Paul Wilson for more details on these workshops and to sign up - pwilson@brainerd.net or 218-764-2994. Take a look at some shots from last year's workshops with the Järvelä family of Kaustinen, Finland, > 2004 workshops. Since 2002 Britt has been an "A-klasse spelemann" in Norway. This means that she has played in the top level at kappleiks (fiddle competitions) in Norway. To get to this level, a fiddler must first win the "B-klasse" for two years. Last year Britt became nr. 5 in the "A-klasse" in Norway. Also this year, Tre Begrædeleige Piger, one of her 'groups', was nominated for the Spellemannsprisen in the folkmusic/gammaldans category. The Spellemannsprisen is the Norwegian version of the 'grammys', and only three nominations are given for each category in the entire country. Although they did not win the prize, just to be nominated is an honor that few musicians in Norway ever achieve. During the last 7 years, Britt has taught fiddling and performed as a free lance musician, most recently back in her home district of Møre og Romsdal. She will teach tunes on 'flat fiddle' from Møre og Romsdal/ Rørospols, or tunes by Sven Nyhus and also some hardingfele tunes if enough hardingfele players sign up. Britt thinks it is easiest to teach tunes by ear, but she also brings sheet music which will be handed out after the tunes have been learned. It may be a good idea to bring a recording device as well. - Bowing techniques that give that danceable groove. - Ornaments and articulation that makes it sound ­ Swedish! - How to arrange music Swedish style: playing a stämma or accompaniment. - How to play schottis, polska, springlek, vals, polka, slängpolska and onwards. Emma Reid and Alicia Björnsdotter Abrams in the fiddle duo Två will teach a full day workshop in Swedish fiddle styles and techniques. The fiddle traditions of Orsa, Bingsjö, Malung and Uppland are most prominent in their styles. 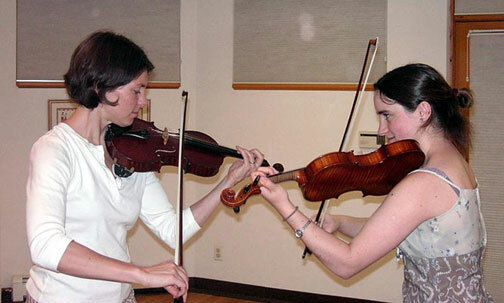 Alicia and Emma both have degrees in traditional Swedish music from the Royal College of Music in Stockholm and have performed and taught throughout Europe and the US. The workshop is taught by ear and participants are encouraged to bring recording devices. Content will be strongly influenced by the interests of the group. Musicians other than fiddlers, if comfortable playing melody, are most welcome.